These dishwasher detergent pacs soften the toughest food residue to allow for easy removal. Finish Gelpacs gently clean dishes while a jet-dry rinse agent helps eliminate spots and film with a 100% concentrated gel. Easy to use and mess free. Just pop it in your dishwasher and go! Great for use in residential or commercial kitchens. 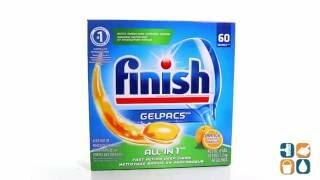 Order Finish Dishwashder Detergent Gelpacs and save. Buy in bulk and save even more!